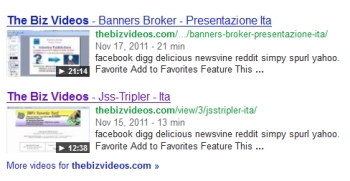 UPDATE: The website of TheBizVideos.com has gone missing, taking with it sales promos for JSS Tripler and other purported “opportunities” in the wake of an action by the Italian securities regulator CONSOB. The site, which appears to use nameservers in New York, is returning a “Server not found” error in Firefox. When pinged, it returns an “Unknown error: 1214” message. It is at least the second website with a direct or indirect tie to JSS Tripler to have gone missing in recent days. A site styled JSS-Tripler.com, which was hosted in Utah, went missing last week under mysterious circumstances. Precisely why the sites have gone dark is unclear. Also unclear is who caused the sites to disappear. Whether JSS Tripler plans to help its affiliates mount a defense in Italy or any other country that may open a probe is unknown. Individual JSS Tripler promoters could find themselves holding the bag for both financial losses tied to their JSS Tripler participation and legal bills. Ponzi-forum posters flogging JSS Tripler have largely ignored the CONSOB action. Precisely when and why the change was made is unclear, but the site was offline last night briefly in the the United States. JBP purportedly is operated by Frederick Mann, who claimed in 2008 to have been a promoter of AdSurfDaily. The U.S. Secret Service described ASD as a massive international Ponzi scheme. Some JSSTripler promoters also have been linked to ClubAsteria, a purported “opportunity” that caused promoters to come under the CONSOB lens last year. As things stand on the JustBeenPaid domain, how a securities scheme operates “in accordance with” a U.S. patent is left to the imagination. The JSS Tripler-related CONSOB probe is about securities and securities licensing, not about patents and inventions.